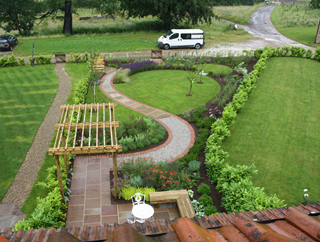 Below are some examples of the garden transformations carried out by Paperbark Garden Design. 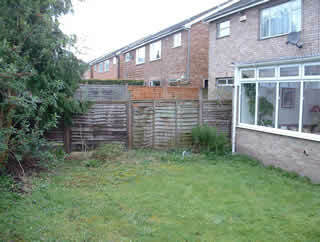 This almost flat garden consisted of an area of mown lawn and simple timber boundary fence. A large open grass field abutted the longest boundary giving the garden an open feeling. 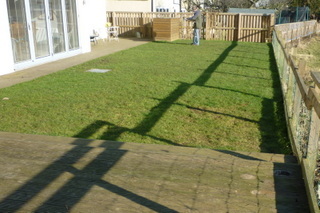 This south facing garden was a complete blank canvas which would be turned into a fantastic sun terrace. The client wished to create an outside area for entertaining and outdoor dining. 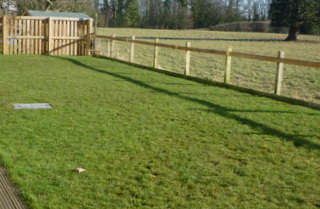 The timber boundary fence was replaced with 'estate' fencing and a gate introduced. 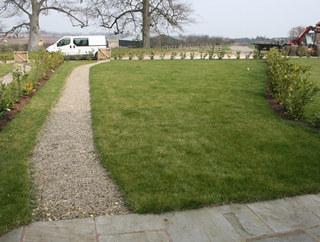 The mown grass lawn was replaced with a mass of flowering plants and formal box heding and topiary. Paving materials and pattern create interest in the hard landscapng. 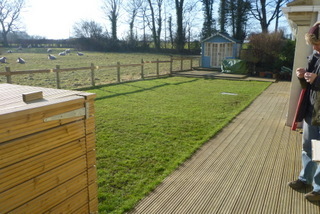 The decking area and lawn before landscaping. Two areas for outdoor entertaining were created. One area, shown in the distance on this photograph, includes a long simple rendered and painted seat with back rest which can take cushions and throws. 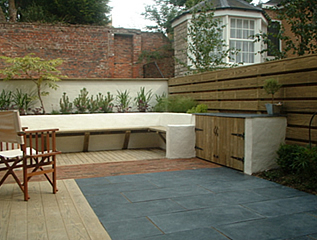 Additional seating garden furniture creates an outdoor 'lounge' area. 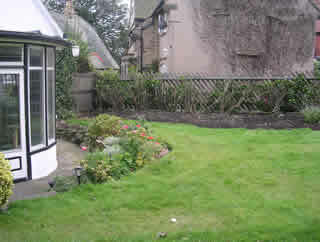 The rural terrace garden before design and landscaping. Immediately following planting, the outdoor lounge area in the foreground and the dining area in the distance. Tea for two in the middle! The box hedging will grow together to form box topiary, trimmed to form a tight 'parterre'. Some larger topiary was also included. 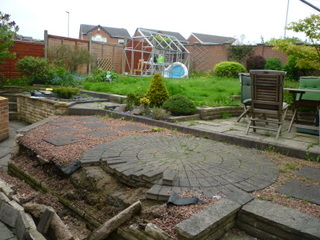 The garden had level changes which had previously been paved and were now collapsing. 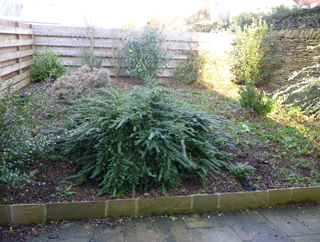 The greenhouse was no longer needed and there were a number of specimen shrubs which needed to be retained. 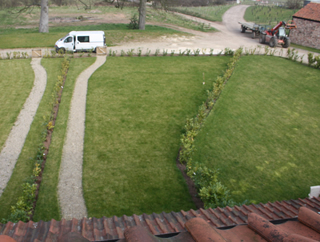 The level changes in the garden were addressed by intoducing gently curved wide steps and curved walls. Yorkshire stone gives the garden a warm feel. Exisiting specimen shrubs were retained in the garden design and carefully worked around during the garden landscaping. 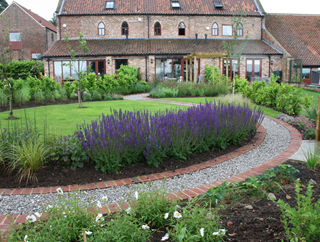 This long garden in Leeds was dominated by an old unusable garage. This took up a huge area immediately outside the back of the house and squeezed the space outside the french doors. 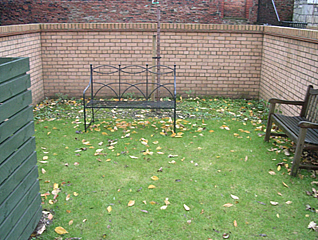 This lower section of the garden was not well linked to the upper lawn area which was a much wider, open space. 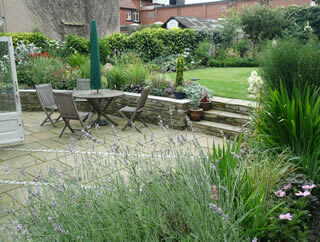 An area for outdoor dining and relaxing was required so that the full extent of the garden could be used. The first step was the safe removal of the old garage. 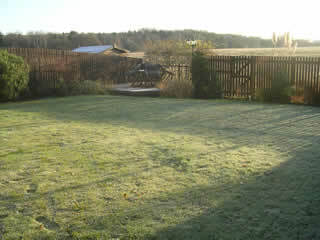 This immediately transfomed the garden and a new modern boundary fence was erected. The lower terrace area was extended away from the house to allow room for outdoor dining. Brick and stone paving were used to create broad elegant steps up to the lawn and higher terrace with a small garden pond. The red brick reflects the building material in the house. 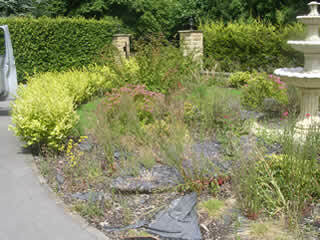 Planting was a mixture of shrub and herbaceous for summer interest and wildlife value. 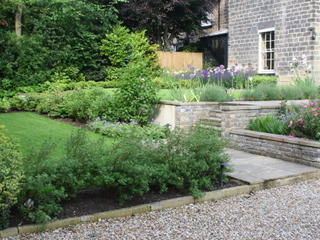 This garden in Roundhay, Leeds consisted of a partially built building project. This incomplete retaining wall had to be incorporated into the new garden design. 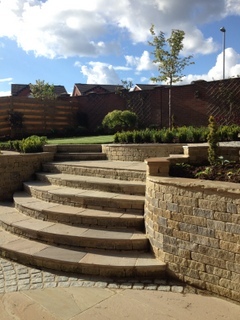 Elegant terraces were landscaped, linked with wide stone steps. A very formal design reflected the architecture of the period house. 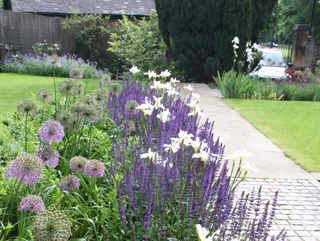 Planting is a mixture of formal shrub planting and regular blocks of herbaceous planting such as iris and salvia. 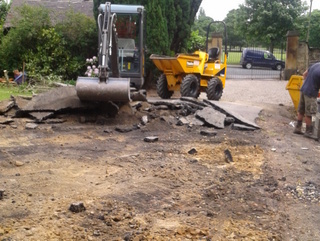 The tarmac drive is torn out to make way for the garden design scheme. The new design sets the house in traditional formal terrace garden. 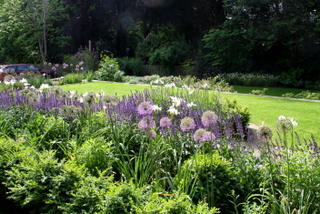 Herbaceous border planting is contained within formal box hedges. 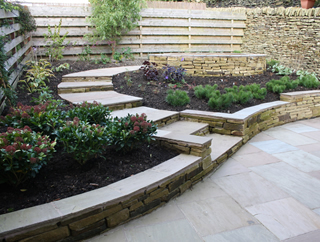 Stone setts and yorkshire stone paving create a formal pathway. 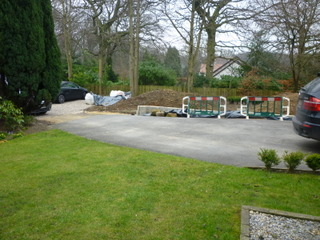 The tarmac driveway and an abandoned previous project. 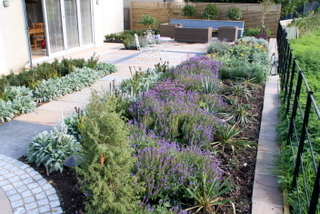 The garden terrace includes herbaceous planting in blues, purples and whites with box hedging and shrubs. 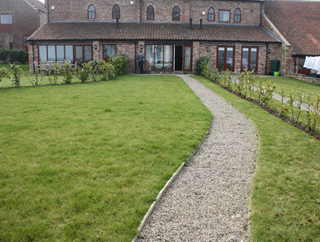 This back garden set in the beautiful North Yorkshire countryside. The garden was underused and the views screened by oversized planting. The finished garden includes an elegant path which leads down through the garden to a seating area which has a small simple pond and simple seat. 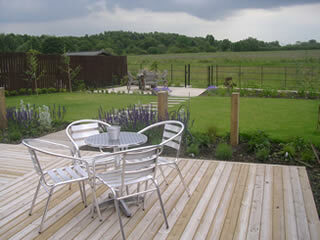 This patio area creates a great spot to sit, have lunch and enjoy the surrounding countryside. An underused plot on a new development, with inaccessible and impractical layout. The whole garden in use: circular seating area and lower terrace placed for all-day sun, local materials to complement the stone wall, low-maintenance planting and a favourite small tree preserved. A blank canvas in a sensitive rural fringe location adjacent to green-belt land in beautiful North Yorkshire. A garden of curves and colour: a flowing lanscape design to break up the open, linear aspect, native hedging at the rural boundary and a seating area at the foot of the garden. A Grade II listed building, recently redeveloped. A garden befitting the house: local materials echoing the buildings, and strong, colourful planting with fruit trees and a vegetable plot. A long-distance view to be preserved, with planning approval required. 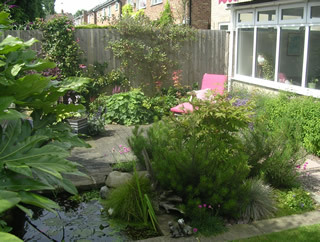 A dining area to relax in: a wooden bench, complementary paving and blocks of vibrant planting for shelter and privacy. The courtyard was an empty and uninviting space. A garden for outdoor eating and entertaining in style: simple seating area, clean open space, barbecue storage and a cool slate table top for summer buffets. An unused space, empty and hemmed in. An outdoor sitting room: a lusher, fresher feel, with informal and exotic but frost-tolerant planting, a pond, space for sitting and relaxing, and a half-covered dining area (out of shot). An unimaginative layout and no real link between house and garden. 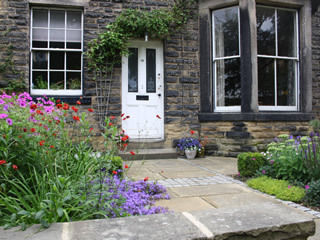 A newly landscaped garden for spilling out into: generous dining area, informal planting (done by the clients, keen gardeners, to our plan), a height difference used to advantage, and the Arts and Crafts aesthetic retained. 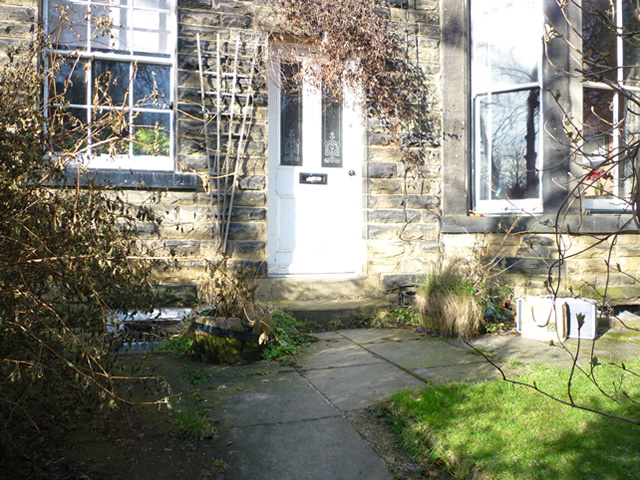 An untidy frontage in a conservation area. 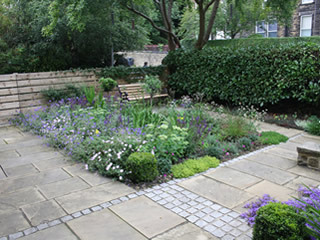 A bright and welcoming way in: contrasting natural paving materials linking two beds of rich and colourful herbaceous planting. A bare and undifferentiated plot with the distant view impeded. 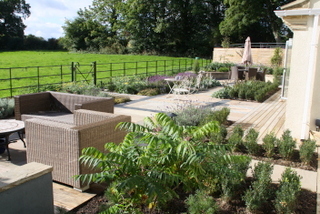 A rural vantage point: an outdoor seating area of warm decking, low and colourful vegetation planting, a visual link to the gate and field beyond, and bespoke estate fencing to open up the view. 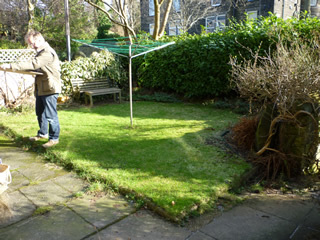 A mossy lawn and a tree requiring council approval before pruning. A garden yard that’s practical as well as pretty: space for hanging the washing and sitting out, safer and more private access to the street. An overgrown and unwelcoming sight for visitors. A relaxing contemporary frontage: simple curves echoing the existing boundaries and providing a focal point, with blues and purples, native ornamental trees and great autumn colour.